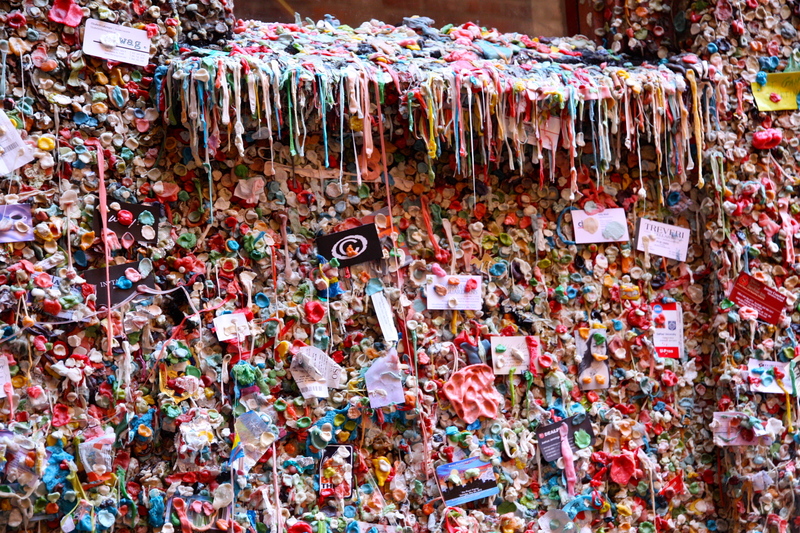 Chewy, gooey gum wall of Seattle | Where to next? Having just written about the spines of cacti, I thought it was worth mentioning the other sticky find we made. I’m talking about Seattle’s gum wall—considered to be the world’s second germiest tourist destination (the Blarney Stone is No. 1). My cousin, Colleen, took us there as part of a tour of the remarkable Pike Place Market. Officially known as the Market Theatre Gum Wall, this landmark is covered in used chewing gum—lots and lots of it. 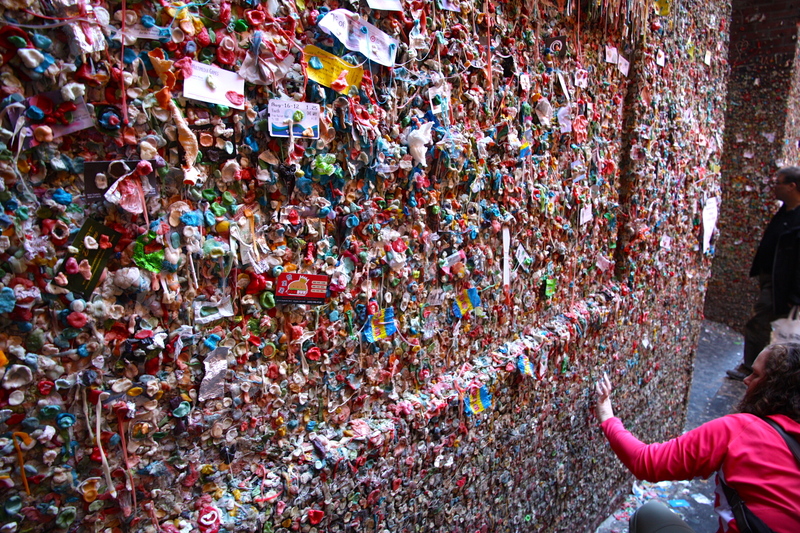 The 15-foot-high wall extends for 50 feet and some parts are several inches deep in gum! Some people even create artworks out of their old chews. The gum-sticking tradition began almost 20 years ago when patrons at Seattle’s Theatre Sports stuck gum to the wall and added coins to the blobs. Theater workers scraped the gum away twice, but eventually gave up after market officials decided the gooey wall made for a good tourist attraction. Seattle’s ghost tour starts by the gum wall and apparently it’s a popular spot for wedding photographs. A scene in the movie, Love Happens, was shot there. This isn’t the only unusual wall we have seen on our travels. Check out our trips to the John Lennon Wall and love locks of Prague. Kissed the Blarney Stone as “When in Rome (or Ireland lol) do what the Leprchauns do!! Personally I don’t worry too much about germs, but I sure wouldn’t be kissing the gum wall. I’m almost sorry I missed that when we were in Seattle. I’m grateful not to have known about it when we visited. Although that was years ago–maybe it didn’t exist yet. Judging from the layers of gum, I think it’s been there for a long, long time. comes to sailing level entertain beneath Jackson’s half dome. into serenity, but the live scroungers will be around in person. enjoyed with the self esteem of roast beef on gluten-free bread. Did the gum wall inspire all that? Greets only those who need to play. Of a happiness once known. Laughs at the summer sun. The love, if ever, returns? Chewing gum certainly has an effect on you!